So, early last week I decided to actually implement some of the well known Windows DLL injection techniques to keep my mind at ease. Hopefully this blog will get you accustomed to those techniques and maybe inspire you to implement them on your own. 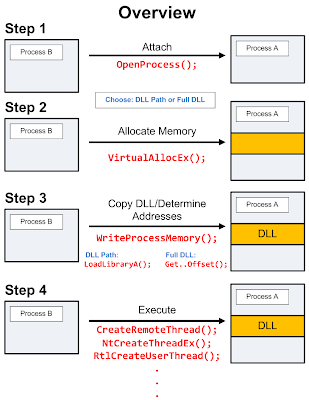 DLL injection is the process of inserting code into a running process. The code we usually insert is in the form of a dynamic link library (DLL), since DLLs are meant to be loaded as needed at run time. However this doesn't mean we cannot inject assembly in any other form (executables, handwritten, etc..). It's important to note that you'll need to have an appropriate level of privileges on the system to start playing with other program's memory. Each one of these steps can be accomplished through the use of one or more programming techniques which are summarized in the below graphic. It's important to understand the details/options present for each technique as they all have their positives and negatives. We have a couple of options (e.g. CreateRemoteThread(),NtCreateThreadEx(), etc...) when instructing the target process to launch our DLL. Unfortunately we can't just provide the name of our DLL to these functions, instead we have to provide a memory address to start execution at. We perform the Allocate and Copy steps to obtain space within the target process' memory and prepare it as an execution starting point. There are two popular starting points: LoadLibraryA() and jumping to DllMain. LoadLibraryA() is a kernel32.dll function used to load DLLs, executables, and other supporting libraries at run time. It takes a filename as its only parameter and magically makes everything work. 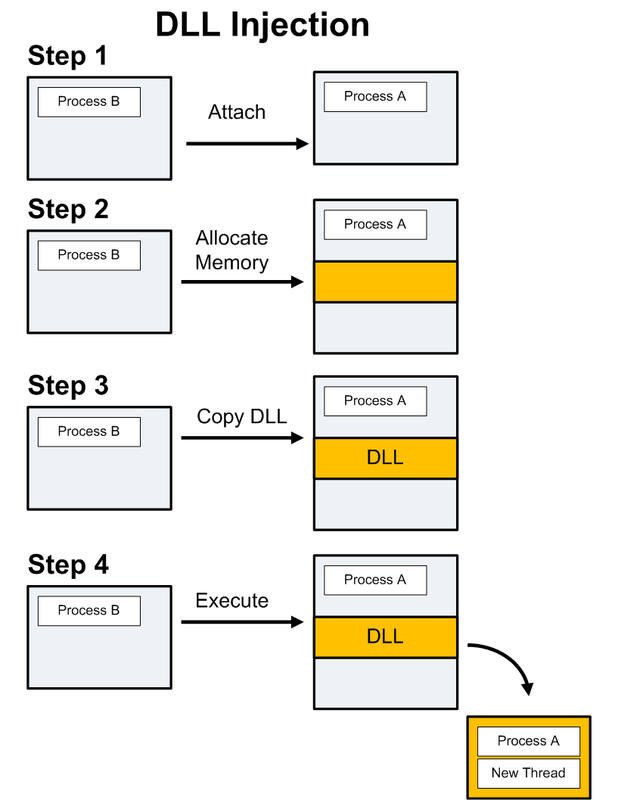 This means that we just need to allocate some memory for the path to our DLL and set our execution starting point to the address of LoadLibraryA(), providing the memory address where the path lies as a parameter. The major downside to LoadLibraryA() is that it registers the loaded DLL with the program and thus can be easily detected. Another slightly annoying caveat is that if a DLL has already been loaded once with LoadLibraryA(), it will not execute it. You can work around this issue but it's more code. 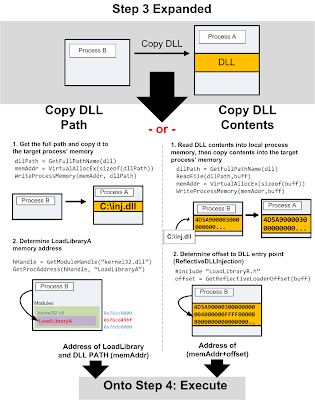 An alternative method to LoadLibraryA() is load the entire DLL into memory, then determine the offset to the DLL's entry point. Using this method you can avoid registering the DLL with the program (stealthy) and repeatedly inject into a process. Before we can inject anything into another process, we'll need a place to put it. We'll use the VirtualAllocEx() function to do so. VirtualAllocEx() takes amount of memory to allocate as one of its parameters. If we use LoadLibraryA(), we'll allocate space for the full path of the DLL and if we jump to the DllMain, we'll allocate space for the DLL's full contents. Allocating space for just the DLL path slightly reduces the amount of code you'll need to write but not by much. It also requires you to use the LoadLibraryA() method which has some downsides (described above). That being said, it is a very popular method. Allocating space for the full DLL requires a little more code however it's also much more reliable and doesn't need to use LoadLibraryA(). We can now copy the DLL (path or contents) to the target process space. 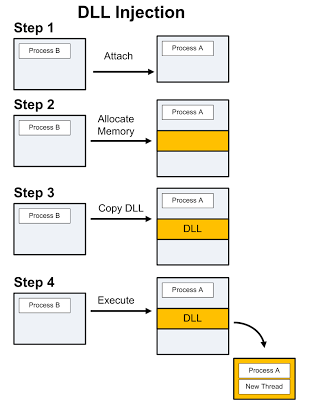 We'll first need to read our DLL into memory before we copy it to the remote processes. Most execution functions take a memory address to start at, so we'll need to determine what that will be. 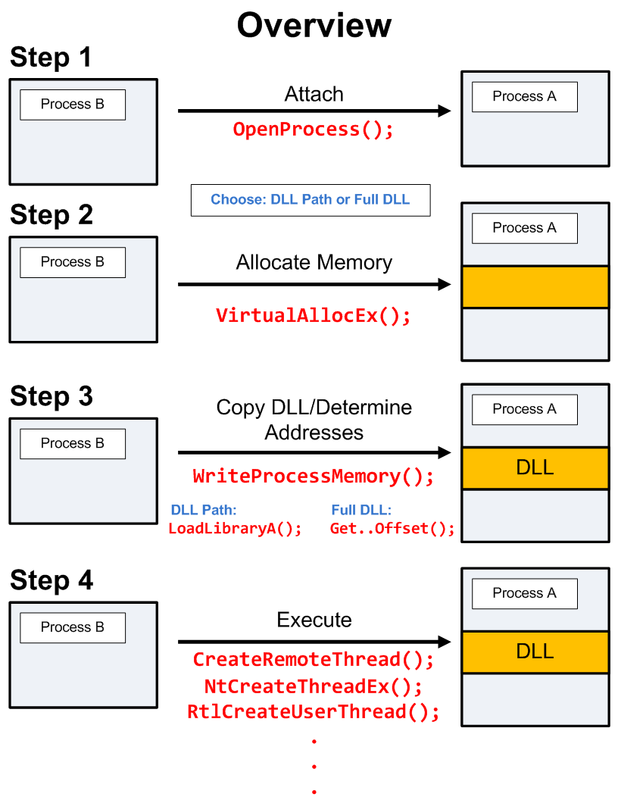 By copying the entire DLL into memory we can avoid registering our DLL with the process and more reliably inject. The somewhat difficult part of doing this is obtaining the entry point to our DLL when it's loaded in memory. Luckily enough, Stephen Fewer has made our lives easy. He's pioneered the Reflective DLL Injection technique which offers a greater level of stealth in comparison to existing methods. The LoadRemoteLibraryR() function included within his ReflectiveDLLInjection Inject project implements this entirely, however it limits our execution method to CreateRemoteThread(). So we'll use the GetReflectiveLoaderOffset() from it to determine our offset in our processes memory then use that offset plus the base address of the memory in the victim process we wrote our DLL to as the execution starting point. It's important to note here that the DLL we're injecting must complied with the appropriate includes and options so that it aligns itself with the ReflectiveDLLInjection method. At this point we have our DLL in memory and we know the memory address we'd like to start execution at. All that's really left is to tell our process to execute it. There are a couple of ways to do this. The CreateRemoteThread() function is probably the most widely known and used method. It's very reliable and works most times however you may want to use another method to avoid detection or if Microsoft changes something to cause CreateRemoteThread() to stop working. Since CreateRemoteThread() is a very established function, you have a greater flexibility in how you use it. For instance, you can do things like use Python to do DLL injection! NtCreateThreadEx() is an undocumented ntdll.dll function. The trouble with undocumented functions is that they may disappear or change at any moment Microsoft decides. That being said, NtCreateThreadEx() came in good handy when Windows Vista's session separation affected CreateRemoteThread() DLL injection. Suspend, Inject, and Resume is an unofficial term to describe the method of injecting into process by attaching to it, suspending it and all of its threads, targeting a particular thread, saving the current registers, changing the instruction pointer to point to your executing starting point, and resuming the thread. This is a much more intrusive method, but works reliably and does not depend on additional function calls. As a side note, DLL injection is very much different then DLL Proxying and Hijacking. For some reason, people tend to confuse these. 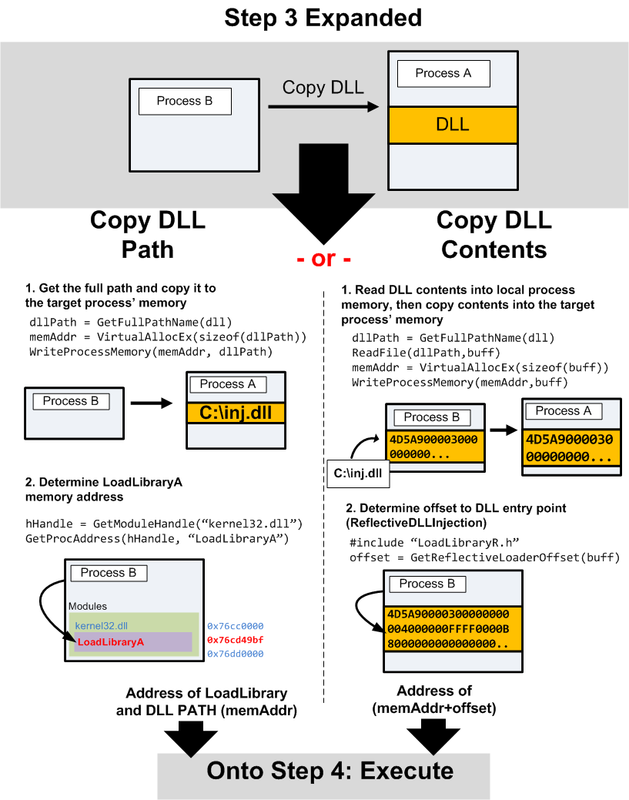 The latter impersonates a legitimate DLL and essentially "tricks" the application to load it, while the former inserts a DLL into a process while its running. DLL Proxying most commonly assumes you have full control over the application's install directory. The "attacker" renames the legitimate DLL and copies their own DLL into the install directory. When the application runs, it loads the attacker's DLL (since it's named correctly) and then the attacker's DLL relays the function calls to the legitimate one. DLL Proxying is most commonly used by the actual owner of the system as a method to extend application functionality. For instance, DLL proxying is popular in the gaming world. Lots of people use this technique to modify game functionality for cheating or other sorts of fun. "Spy" applications also leverage DLL Proxying in an attempt to capture user provided application values. DLL Hijacking is similar to proxying but differs in that hijacking usually abuses Windows' DLL search order in order to compromise a system (or otherwise control the flow of the application). It doesn't usually require the attacker to have write permission to the application's installation directory but rather the directory where the application was launched. In the case that the application attempts to call a non-existent DLL or if an attacker was able to place a malicious DLL in the same directory as a file that launches a vulnerable application, the attacker's DLL would be loaded and code execution would be achieved. This is because Windows [used to] search for application DLLs in the current directory from which the application was loaded before most other locations. You could not have posted this at a better time. I've been reverse engineering some malware lately that uses DLL injection, and while I kind of understood how it works, this post really clicked with me. Great work! Awesome! I'm glad we could help! This topic has been explored in the past. Yours has excellent diagrams though. Good article. Great Article.. just a question, how can i set when to inject the function from DLL? i mean..
heres ProcessA which has Add(), Subtract(), Multiply(), Divide() functions. and ProcessB (the DLL to be injected) has Modulo() function. How can i execute Modulo() everytime the Add() function is executed? thanks. What you are talking about is API hooking. Great article, very well done. I acquired the code from github -- please be aware that as of April 29, 2014 -- the code has issues. I am working with the Reflective loader. It appears you took steven's work (a loader program and a dll) and attempted to merge them into a single project. Compiler defines are missing and the result -- compiles without error but has many bugs do to implementation that needs to be addressed. Thanks for the article and the code .. at least it is an insight as to how things work. Anyone wanting to use it needs to understand how things work ... in doing so they will find what needs to be addressed. I believe someone has completed a DLL injection to a computer I'm looking at, at work, but I am extremely new to this -I only recently finished the beginners networking course and I've only been working in this job for a few months. How do I get rid of this? I don't even know where to go on my computer to start looking at these dll files in order to see if there is indeed an injection or not. AVG keeps coming up that NtCreateThreadEx has a hook and is infected. I've completely replaced the hard drive three times and have flashed the bios and neither of these have eliminated the issue -so I'm super confused about how to get rid of it. Some of the computers at work have information that needs to be secure, so I need to find a way to remediate this potential security risk. In "GetReflectiveLoaderOffset()" it seems to look for a specific function "ReflectiveLoader" inside the DLL. So if we want to execute our DLL with NtCreateThreadEx, does this mean we need "ReflectiveLoader" as a function name for the entry point ?